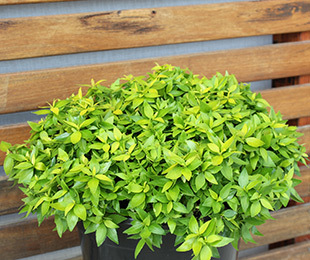 Description: Little Gold™ Abelia contrasts well with green, red and blue foliage plants for endless design possibilites. This compact, tidy plant forms a dense shrub, or alternatively can be used as a ground cover when pruned once or twice a year. It has reasonable drought tolerance and is moderately frost tolerant. Size: 60-70cm high x 80-90cm wide. 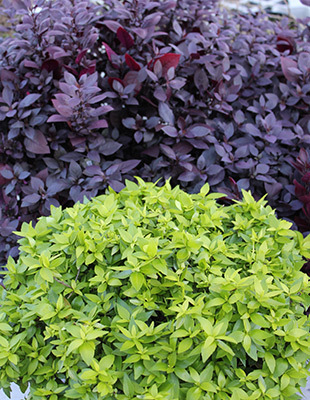 Uses: Specimen planting, hedge, pruned ground cover, mass planting or as a wide border plant. Position: Full sun to part shade. Reasonable drought tolerance and moderate frost tolerance. Prefers free draining soils. If in heavy soils, plant in a raised garden bed. Care: Water as required for 8-13 weeks until established. Plant in a well mulched garden (chunky mulch is recommended). Prune annually if required to remove old foliage. More frequent light pruning will be required if it is being used as a hedging plant or ground cover. Where it works: QLD, NSW, VIC, TAS, NT, SA & WA.